COMMENTS: A beautiful, if not confusing, system. There are two separate double stars in the field. The northern most pair has a bright light blue primary with a fainter gray-white companion. 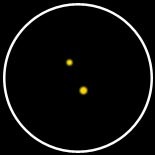 The other pair are close in magnitude and equal in color. It is my guess the later pairing is Struve 747. Many assorted stars in the field make for a wonderful view. 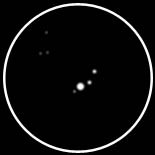 Note: This is just north of the Orion Nebula. COMMENTS: A very close pairing in Orion's head, but not difficult to resolve. The brightest of the two is blue and the other is more white in appearance. COMMENTS: The famous and very beautiful Trapezium star system. 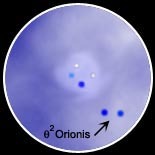 Four blue stars embedded in the magnificent Orion Nebula. COMMENTS: An earlier mystery is now solved. 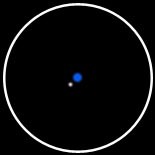 This system is near the Struve 747 pairing. 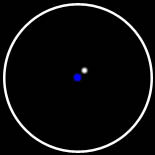 The primary is bright blue and the fainter companion is a grayish white color. COMMENTS: This pairing of stars is near the Trapezium system and on the edge of the Orion Nebula. They are both bright and blue. COMMENTS: A nice multiple star system. The Astronomical League Double Star list only mentions three stars, but another lies very close by. There is another pair to the upper left in the field-of-view. The brightest is pearl white, while the other is gray-white. COMMENTS: I'm a little unsure of this one. 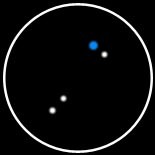 The bright light blue star is definitely Zeta Orionis (Alnitak). I would guess the two companions are above and below the belt star. Neither are remarkable. By the way, no sign of the Horsehead Nebula! 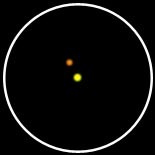 COMMENTS: The brightest star in the pair is dark-yellow. The other is a dim golden-yellow. COMMENTS: The primary is light blue and vastly outshines the pale-gray companion. The dim companion was difficult to find at low magnification. High magnification and a sharp focus are needed. COMMENTS: The brighter of the two stars is yellow. The fainter star is perhaps dark orange. It was difficult to tell for sure.